Some work processes cannot be perfectly controlled nor perfectly defined. There may be non-linear interactions between steps in a process or there may be creative input from a human required. Processes with these qualities require empirical process control. The basic attribute of empirical process control constitutes a continuous cycle of inspecting the process for correct operation and results and adapting the process as needed. A simple example of this is detecting impending failure of equipment by constantly monitoring the operation of that equipment. For Agile Work, the book Agile Software Development with Scrum provides an excellent chapter about this topic of Empirical Process Control. In human processes like those to which Agile Work applies, the frequency of inspecting and adapting must match the needs of the process. Many projects occur in the context of constant change. This constant change makes long-term planning a wasteful effort. Rather, short-term planning with constant feedback provides a simple inspect and adapt cycle. This cycle can play out at different levels: daily for a team, monthly for a client of the team. The team inspects and adapts daily at the level of the tasks that it is performing. The client inspects and adapts monthly at the level of the team’s actual delivered results. Both lean and agile methods claim to increase both speed and quality. Many people believe that there are four constraints in a system that can be controlled: speed (or schedule, or time to market, or process cycle time), quality (number of defects), scope (how much functionality), and cost savings (how much to spend on the work). Frequently, management believes that one has to trade off between these four constraints; spend more money, get more scope; lower quality, go faster. But in fact, lean and agile strongly support the idea that as you increase quality, you also increase speed… you just have to do it right. In Agile Work, increasing speed and quality is done in three ways. First, increase the frequency and quality of communication among team members so that errors are detected early or avoided altogether. Second, drive the work with the creation and execution of automated testing. No work is done without a test in place to check if it is done correctly. This constant testing means that work is always defect-free and therefore very little time/money is spent on fixing defects. Third, eliminate wasteful work steps or obstacles to performance of work. This last one is difficult to do an bears closer examination. Wasteful work is done in every process, no matter how efficient. Lean tells us that there are several types of waste in a manufacturing process. Those types of waste have analogies in Agile Work. For example, documenting something you plan to do instead of just doing it is wasteful. Another example is waiting while someone completes work that you depend upon. Any step or task that does not add value to the final product of an effort is waste. This standard is very high and most organizations have about 80% of their efforts going into wasteful tasks. An organization that has done an initial cut of wasteful work might stand at about 50% waste. The leanest organizations, such as Toyota, stand at about 20% waste. 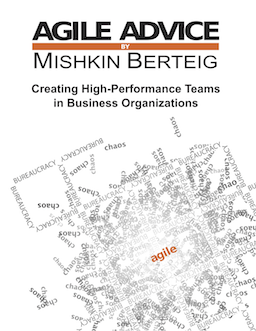 Agile work eliminates waste in the form of barriers or obstacles that come up when a team is trying to go fast. Sometimes this is in the form of waiting for another group to do something for the agile team… an outsourced request for service. Sometimes waste is in the form of corporate standards or policies around documentation of work. The Process Facilitator role in an agile team has responsibility for working with the team and others to help overcome these obstacles.